Years and years ago I thought it would be cool to have one of those fancy tub caddies. 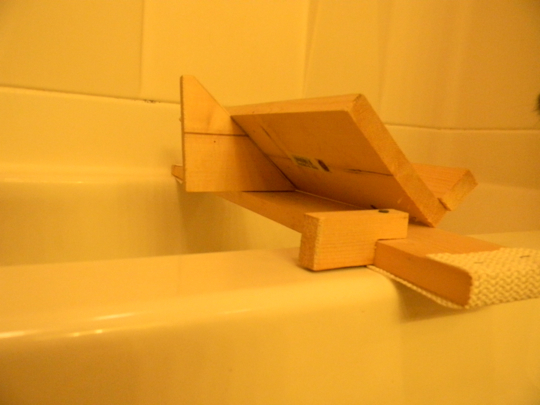 (I thought about it right after I dropped a book in the tub.) 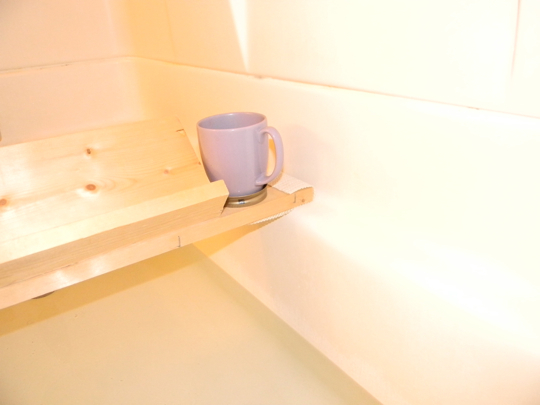 Yes, a place to rest your glass of wine and a book while relaxing in the hot water…. bliss. But I’m cheap, so I made one. Yep. Them there are some one-by-fours all chopped up and screwed together. Not even sanded, because that’s too fancy for these here parts. It’s got some no-slip carpet stuff on the sides so it won’t slide around, and an extra piece of wood screwed to the back because the dang thing kept tipping over. For one’s wine glass or coffee mug, there is an upside-down mason jar lid screwed into the board, because I’m fancy like that. I got it out for the cats to use as a bridge. They knocked over the mug. bridge/book & wineglass holder STAT! Could your cats re-enact the story of Three Billy Goats Gruff???? Ha! 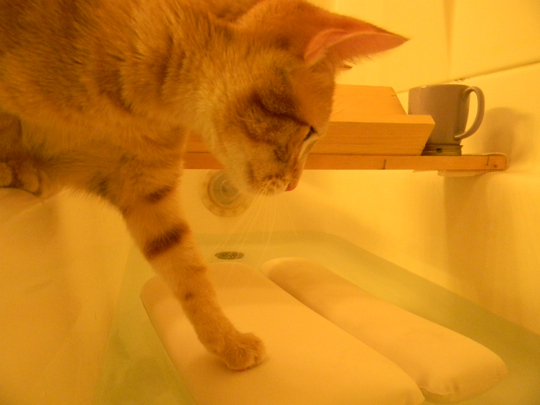 I still think it’s funny how much your cats are obsessed with water. Perhaps you could ship them to Hawaii.